Our corporate office/warehouse is located just south of downtown Dallas in a building with a trail of history. We started business at 1516 Corinth in 1959; as our business grew, we needed additional space and moved into our present facility at 1500 Corinth in 1980. Frank Kehr purchased the historic Compton Citadel Salvation Army building, originally constructed in 1937, for Regis' new headquarters. The building was originally named for C. V. Compton, a prominent Dallas attorney, who was active in its establishment. According to the news accounts from 1937, the building "was not a relief agency, but more of a community clubhouse. It contained game rooms, sewing rooms, classrooms, and last but not least, a public washroom where a woman may do the week's wash." In the latter part of 1938, Mr. and Mrs. Compton added a large gymnasium and craft room to the Citadel. The enlarged community center was to serve a neighborhood that was lacking in adequate facilities for social activities. The Dallas press quoted "Mr. and Mrs. Compton have acted wisely and generously in both establishing and enlarging this community center." When the gymnasium was dedicated in January, 1939, the auditorium was equipped through the generosity of Sears Roebuck & Company. Later a full library was added with the donation of over 500 books along with two additional frame buildings that were adjoining the Citadel to house a nursery school and lodging for one of the adjutants in charge of the center. When Frank purchased the building, the architectural plans included keeping the original gymnasium floor. Our main warehouse is located in that gymnasium where the wooden floor still remains from 1939. If you're ever in the Dallas area, feel free to stop by our facilities for a "nostalgic" tour. "Treat People the way you want to be treated and do what you say you're going to do." 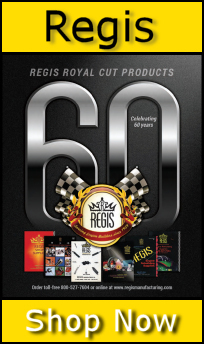 As our business continues into its 60th year of service to our valued customers, we want to thank each of you for continuing to believe in Regis. Since our humble beginnings in 1959, we have tried to offer you quality products and service at reasonable prices. Our past success as well as our future is due in large part to you, our customers. As our philosophy has been stated throughout the years, we believe in treating our customers with respect.. Since acquiring the company in 2009, I have had the opportunity to meet many of you at our office and recent trade shows. We are continually researching new products that are needed for the future of our industry. Regis continues to work hard to bring those products to you — our valued customer. Please continue to let us know how we can better serve you as we continue to grow our business for the next generation. On behalf of the entire Regis team, thank you for the continued trust and support you place in us to be your provider of shop supplies! 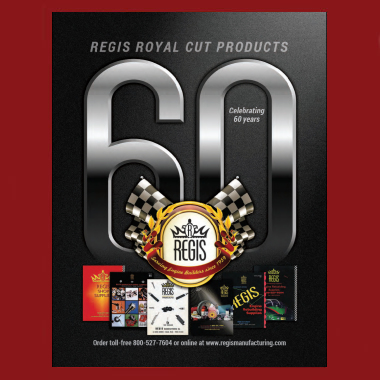 Again, don’t forget to check out our website: www.regismanufacturing.com.